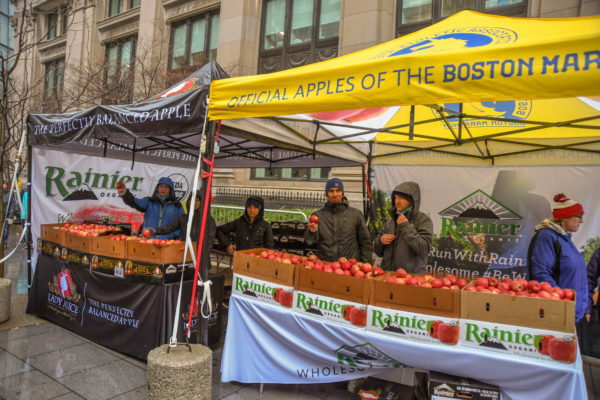 For the third year in a row, Rainier Fruit had the honor of sponsoring the Boston Marathon. In formal terms, we’re the official apple of the Boston Marathon (keep that one in mind for your next trivia outing). What does that mean? Our apples show up in a few different places surrounding the marathon. Host hotels offer complimentary apples to guests and runners. Apples are featured items on menus at partner restaurants. Runners receive apples in their finish line bags, and apples are passed out to crowds that amass to cheer on runners. But the best part? Our team gets to attend the event. To say that the city of Boston is abuzz with energy surrounding the marathon would be an understatement. The marathon essentially takes over. It’s rare to see an entire metro area rally around a single event the way that we’ve seen it happen in Boston. This year, however, the energy was just a little different. You can’t plan on the weather. The day of the marathon, a “come hell or high water” mentality permeated through downtown Boston. Runners were ready for whatever nature was going to throw at them – many in waterproof gear. Those that were less concerned with their time donned plastic rain ponchos. Spectators were creative. We saw several people with plastic bags worn over their shoes and tied around their ankles. Lots of people wore shower caps. Some of our team had so many layers on; they were channeling Randy (the little brother from A Christmas Story). What did nature have in store? A veritable monsoon. Looking outside on Monday morning, the prospect of staying in a warm bed was much more appealing than standing outside all day. Fortunately, that irresistible marathon energy was stronger than inertia for thousands of spectators, not to mention the runners themselves. 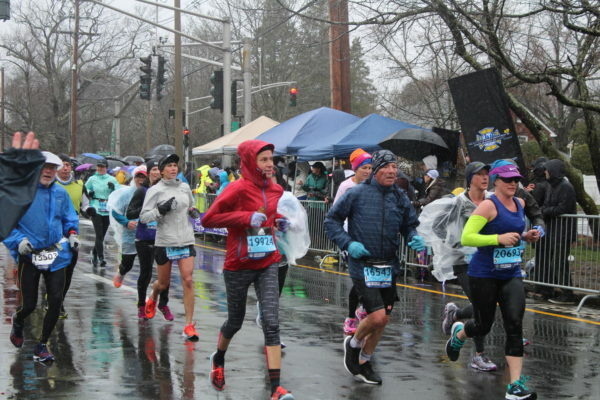 The audacity of getting up to run 26.2 miles through a cold, windy, rainstorm is almost too much to comprehend, and yet – 30,000 people showed up at the starting line that day. That in itself is pretty amazing. 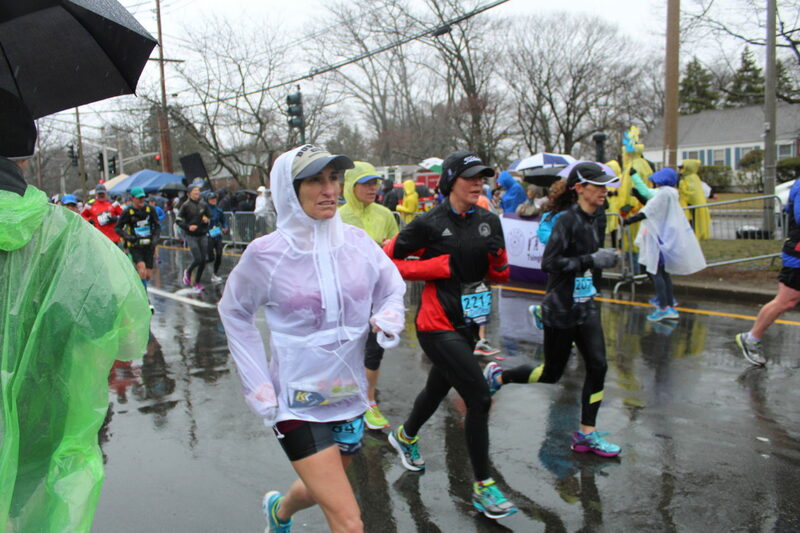 The tenacity of the human spirit was on full display at this year’s Boston Marathon. 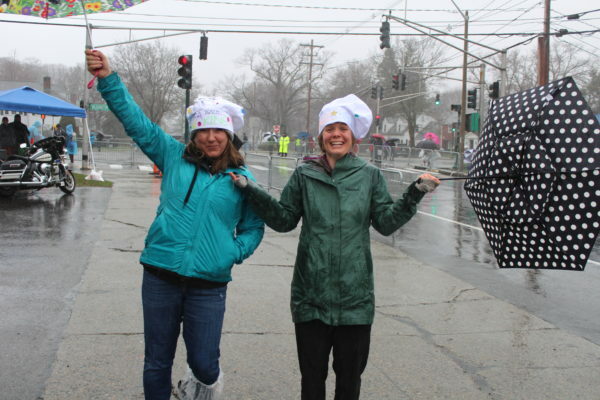 Through 40-degree weather, unrelenting rain, and blustery winds, runners persevered. Accomplishing a marathon in perfect conditions is impressive. Under these conditions, it’s superhuman. Beyond inspirational. The heart, determination, and athleticism that went into the feat makes other daunting tasks seem suddenly surmountable. What can we learn from these amazing runners? We are capable of so much more than we might think. Pushing through adversity, even when it seems like all things are against us, is part of what makes us human! When we consider what thousands of runners achieved at the Boston Marathon, it should inspire us to push harder, dig deeper, and accomplish the things that we set out to do. Our team feels so fortunate to have witnessed the feats of human tenacity and we’re so proud of our Rainier runners, who all finished the marathon in spite of hypothermic conditions. We are beyond impressed! With all that said, we’re still hoping that next year’s marathon will take place under more friendly skies.